There were no issues getting neon – Plasma – to run. The distro booted fine, with a clean splash, without any text messages or errors or artifacts of any kind. Plasma 5.14 comes with a new wallpaper featuring cool colors, blue and purple and rusty red, which lend the distro an added edge of suave. If you feel like I’m gushing, feel free to skip a paragraph or two. The system looks nice, there’s good visual clarity. The fonts are reasonably crisp. This is not Plasma specific – but then, it is. You will like to know that all the hardware was properly detected and initialized. But there’s more. 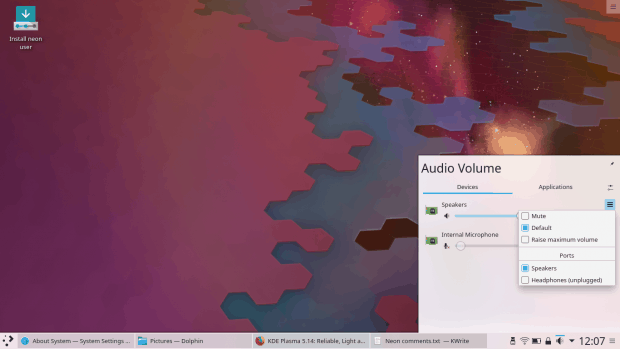 Plasma 5.14 comes with improved audio management. You get more logical, more streamlined controls, and a slightly cleaner view than before. But there’s a nice little extra surprise, too. 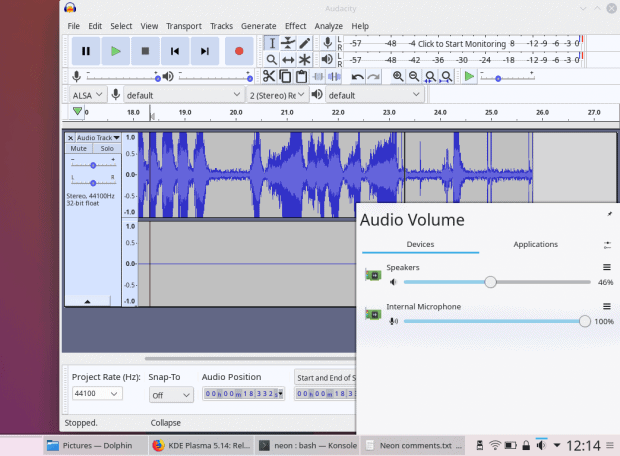 If you recall my distro tests on this laptop, I’ve complained that the internal microphone is often muted or set to a really odd, super-low level, which makes any sort of recording (or speech) difficult if not outright impossible. I’ve outlined this many times over the years, and most distros failed to provide a GUI-based tool – I’m not talking about command line hackery – to remedy the default settings. Plasma 5.14 is the first system to actually highlight the problem in the visual way and offer the necessary fix. You just need to move the slider to the desired microphone volume position, boom, done. Previously, this often didn’t render the desired results. I am quite pleased that this has finally been implemented in a sane, pro way. Noice [sic]. Still kind of hardware related. And this is a big one. If you recall my Plasma & HD scaling article, I talked about the scaling issues I encountered using my Slimbook Pro2, Namely, things render too small on its 14-inch laptop with the full 1920x1080px resolution display. I tried using the built-in scaling, but this resulted in really odd artifacts, and had to solve the problem through manual font changes and lots of special overrides for the browsers, Gnome/Gtk applications and such. My woes with this still aren’t done, and we will talk about this at length in my Slimbook testing & usage follow-up reports. 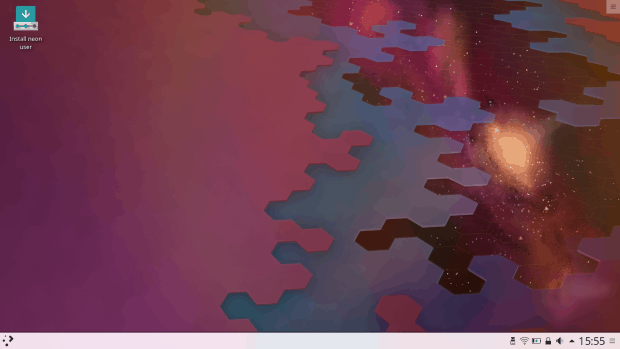 Plasma 5.14 improves things – on all sides. 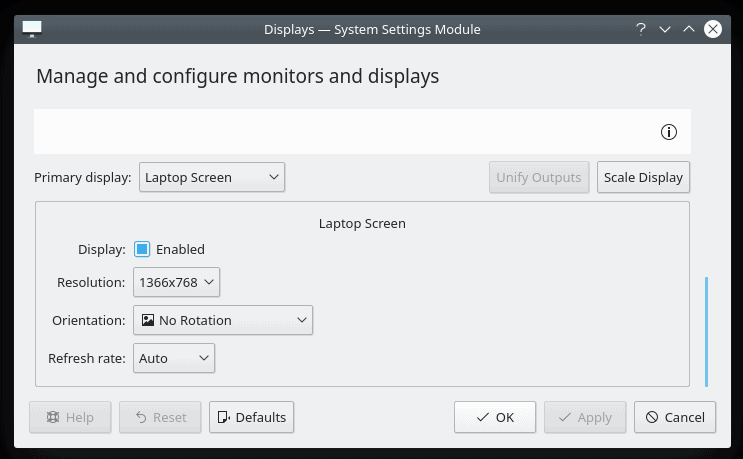 Better display management, more control over non-Plasma software, fewer artifacts when scaling the display up. 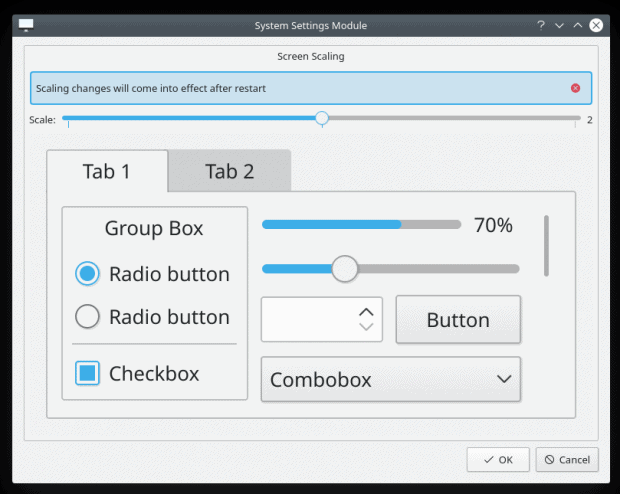 This is a major incentive to move to this release, although I will wait a little to see how Kubuntu 18.04 handles this, and if/when we will see this version land in the standard LTS channels, because running what is essentially a tech-demo distro in a production environment isn’t the best choice. But I’m really pleased with this. The default screenshot tool, Spectacle has been improved. It’s got a more logical layout, closer to what the good ole KSnapshot used to have. The Save As button now stands out. There’s a new capture option called Window under cursor, which can be quite helpful without switching context. In general, this is a much better, cleaner solution, and makes for faster use, although the most optimal way forward would be to also include the file name right away to save an extra click. You gain an extra few hundred pixels of unnecessarily gradiented background, rounded edges, which go against the Plasma stackenblochen philosophy, and you also have to work hard to flush images to the left. This means if I want to work fast and save myself time editing screenshots, I still need to use non-native programs like Gnome screenshot in KDE. Well, hopefully, there will be a simple decorations on/off toggle one day. Wax on, wax off, Mr. Miagi and The Plasma Kid. 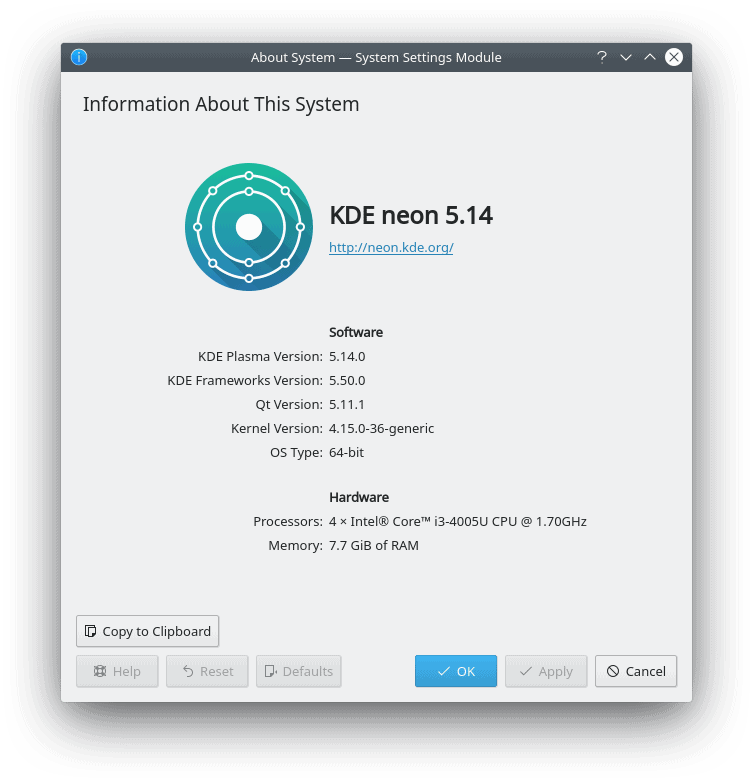 Overall, Plasma 5.14 is a better system than with its predecessor. This shows all over, mostly in tiny, subtle improvements, in fine detail. I don’t like the whole continuous development nonsense, but I do like when things are made smarter and better, especially if they aid productivity and fun. The browser integration is a good example. We did see this before, but it’s gotten better. Fewer errors, more fun. 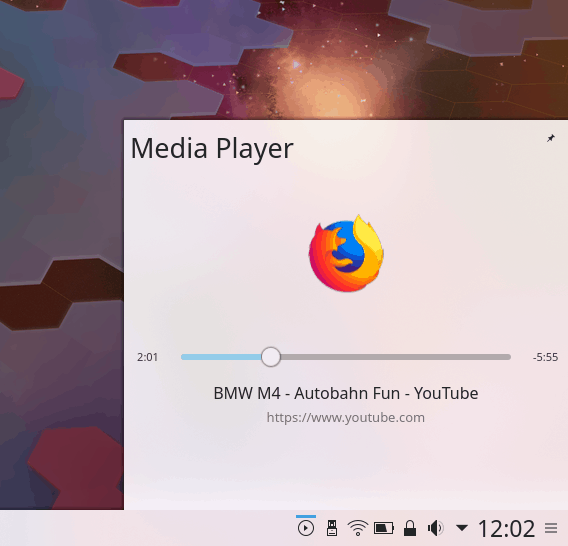 You still need to open a browser and install an extension (the Firefox one has 10K users and an almost solid 5.0 star rating), but once that’s done, you will have contextual control of your browser media through the system media widget. Again, this can be made ever better – show the actual content (for any video), add more playback controls, display the full address, and a few other tweaks like that. Still, this is a right step in the right direction. 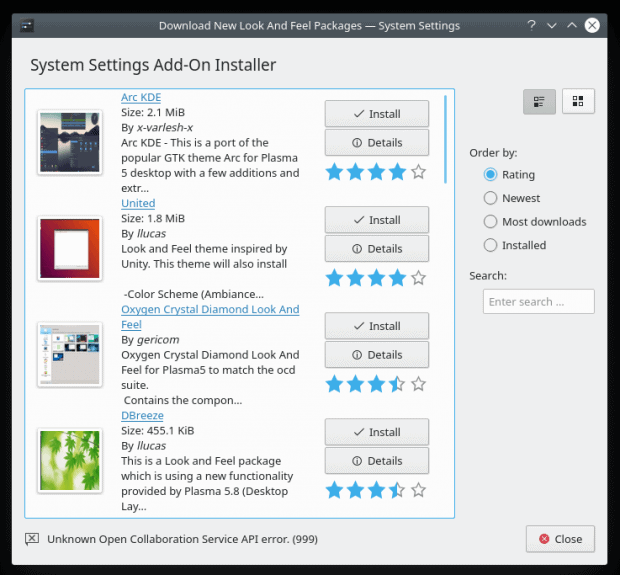 The one aspect of Plasma that has really improved – the graphical package manager. I’ve never found use for Discover in the past. It was slow, clunky, buggy, imprecise, it would often stall, show inconsistent results, the settings were all messed up, and it offered no advantage whatsoever over the command line interface. Which is bad, because ordinary people don’t want to muck with apt-get. The new Discover comes with a more consistent interface. It’s also faster. Much faster. It responds to clicks and actually does things. Not without fault though. The settings all showed invalid entries (undefined), as though the program could not read the repo management files under /etc. Once or twice, I did see a few lines of text flash before they disappeared. I think this was in reference to the new packaging mechanisms supported under Discover, but I can’t say for sure. Twiddling with this also triggered a crash. So Discover is not quite there yet. The side scrollbar changes when you use it (gets thicker), and this feels inconsistent. The thin, gray one also looks out of place. The settings remain the Achilles’ Heel of the whole thing. On the other hand, you can actually now manage system themes and decorations through Discover, and I believe this will eventually replace the system addons facility, which, by the way, remains broken, with all sorts of odd errors, no matter which way you go about it. A nicer, cleaner way of managing Plasma Addons; there are still some visual glitches here and there, like the ‘Still working’ overlay at the bottom of the interface and the inconsistent (thin) scrollbars, which change size when used, becoming blue and thick, and always seem to cover parts of the interface, like the logo in the top left corner. Let there be themes! And you also get ratings, nice screenshots, everything. Launching a program, which is linked by at least half a dozen sub-panels in the system settings menu, and then to have it not work, replete with ugly errors, is really counterproductive to a good Plasma experience. 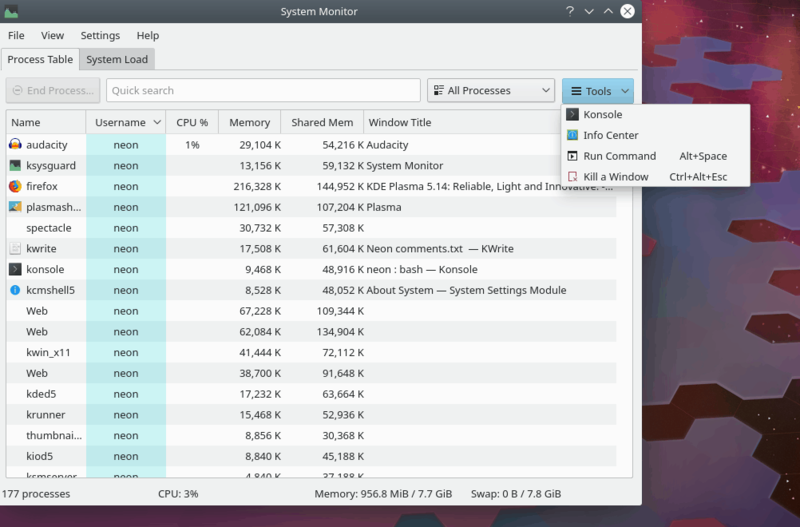 The system monitor also gains some in this release. There’s a new Tools option, which allows you to launch some additional utilities or perform some basic actions. Most of this caters to new users, as techies have their ways of doing it anyway. A nice gesture in the right direction. On a side note, the naming convention is a bit confusing, as the program is actually known as KSysGuard, and that’s not intuitive. Process Monitor, Process Manager, Task Manager, System Monitor, all these are better options. The encrypted storage mechanism in Plasma has also been facelifted. You get more control and fewer bugs, win win. I did not find an easy way to do any sort of import, as the release notes say, so it would be helpful to clarify that. On the other hand, you gain things like the ability to associate/limit Vault with specific desktop Activities (these need to be featured more prominently to make sense, though), and you can also go offline if you have Vaults with sensitive data that you do not want to expose online by accident. I really have zero complaints when it comes to Plasma’s speed. This desktop environment is phenomenally well-optimized, and it runs slick and quick no matter what. On idle, the memory footprint is low and the CPU barely ticks. Applications open instantly, and there’s little to no lag when doing things. I found the mouse cursor management to be neat, too. 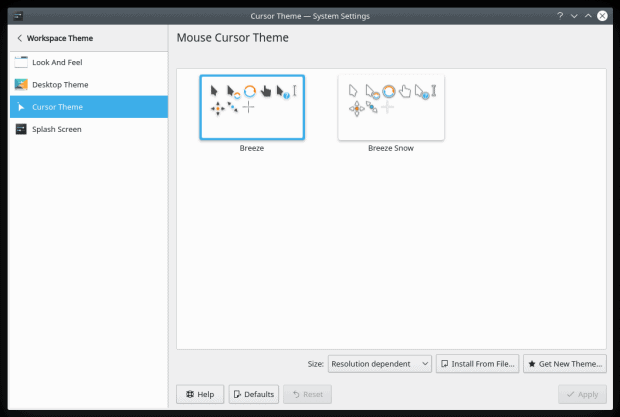 You can of course add new themes, but also dictate if the cursor is resolution-dependent. This probably won’t make you richer, but it might be helpful if you have some multi-display setup with screens of different sizes and with different resolutions. There were some issues, of course. Functional and aesthetic. For example, the network settings window opens at less than full height, so there’s a scrollbar on the right. But the scrollbar also controls what is shown in the left pane, meaning the +/- buttons for adding and removing new networks (like VPN) are obscured from view, so you might think they are not there. I would expect the scrollbar not to hide what is largely an empty pane, unless populated with many known networks, and if then, there should be some separation between the UI functional elements and on-the-go content. Take a look at this window: the left pane looks complete, and there’s no indication whatsoever that anything is missing here, or that you need to use the scrollbar – which is a waste of mouse action – to get to the bottom of the left panel, where you can add or remove networks. 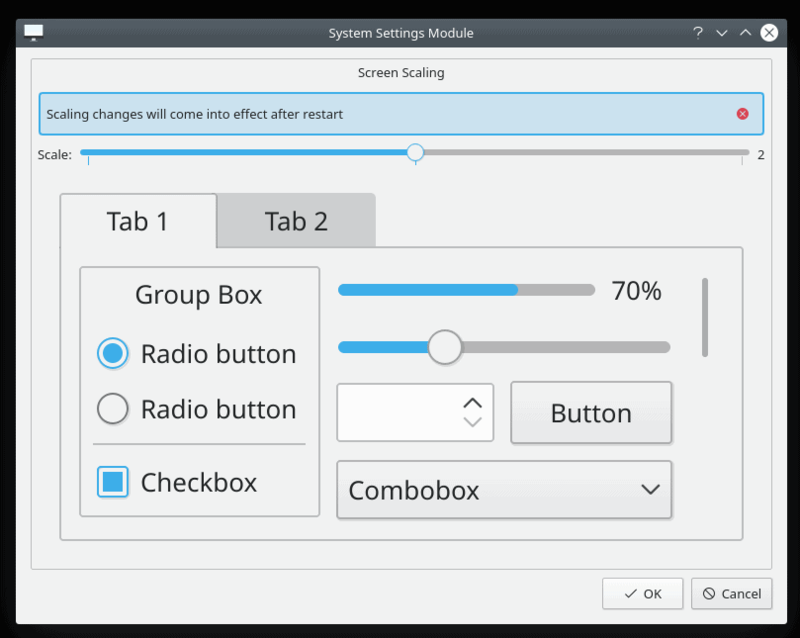 The same interface with the full height shown and no scrollbar; the network buttons should always float and only the listed (known) networks should potentially be obscured if the vertical size of the window does not fit the complete list. I also noticed that Online Accounts are sort of on the down low. I’d like to see this functionality re-introduced and featured, because it could give Plasma users even more fun and control of their stuff, especially if Plasma is ever going to make into the mobile world. The display management screen is too big – you actually have a huge, empty white canvas, which can definitely be smaller, more compact. If you resize the window, the stuff gets pushed up, losing focus, so you need to use the scrollbar to get back to what you were doing, and this can be a little tedious, plus it is not consistent with how Plasma windows behave on resize. The Dolphin sidebar still shows internal partitions in an odd fashion. The labels mean little. Safe removal of certain external devices should be an option, too. The users should have some ability to choose what type of external media to show or hide. Copying files to Samba shares through Dolphin resets their timestamp to the current time. Still. I have to say I like what I’m seeing. Plasma is maturing nicely, and there are really intelligent improvements being added into the desktop. This is not a case of just piling up new stuff to showcase activity or look busy. We’re talking a tight feedback loop from the community, and a genuine attempt to improve the product and offer a high-quality setup for people to run their stuff and enjoy themselves, a holy mission that seems to have been abandoned in the Linux world in the past few years. Plasma is set to re-ignite the passion and fun, and I’m really happy that it’s showing steady, consistent, meaningful improvements over the past several releases. Now, we may have reached the end of the article, but we’re not done. I will be commencing a second Plasma 5.14 test, but I’ll do this after upgrading my KDE neon instance. This will be a triple test: 1) see how well the neon upgrade process works, from the 16.04 to the 18.04 base 2) see how well the new neon behaves and what it does, especially when adorned with this new Plasma 3) additional desktop environment tests per se. 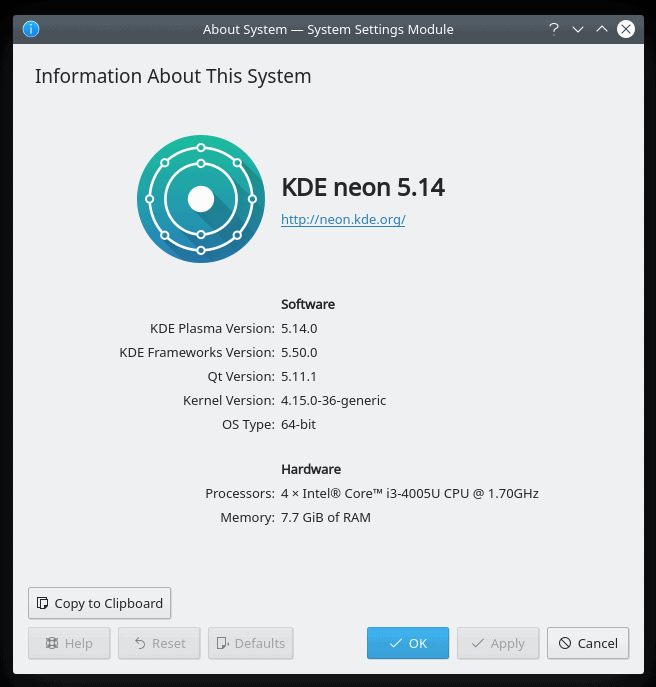 Anyway, until the next time – I’d recommend you grab yourself a KDE neon image, burn it to an external media, and do some testing of your own. I am confident you’ll be pleased. We shall continue, and keep those phasers on stun. Good stun, that is. Take care. The general trend of your ‘KDE Attributes’ curve seems to be, in general, concave-upward. You’ve almost convinced me. One of my psychotic tendencies, however, is a need for hard data on battery consumption before I’ll commit to anything which might affect that. Any help? Do you mean install Plasma 5 on MX Linux? if MX-Linux is a general-purpose, well-behaved Linux distribution, is there anything which would dictate that one’s time would be better spent not trying to install this DE (or UI, if you prefer) on MX? The best DE on top of the best Distro. Wow! That would be a nice article. Or you can use “Flameshot” ( QT ) instead ; in fact, plenty people go for the latter since it adds some basic editing features . Just remembered reading on several forums that Deepin Screenshot seems to be even better than Flameshot . Didn’t try it yet myself, although read it is precisely based on how Flameshot works… but improving the rough edges, making it even easier to use. Just checked a few screencaps & vids with Deepin-Screenshot working… and knowing how most Deepin own tools work i’m inclined to believe it might be indeed quite easy & intuitive to use… and looks like it’s also QT ( maybe a fork of Flameshot as suggested ? ) . Deepin Screenshot is great. The only issue was its slow startup time and Deepin’s developers have finally been able to address that issue. 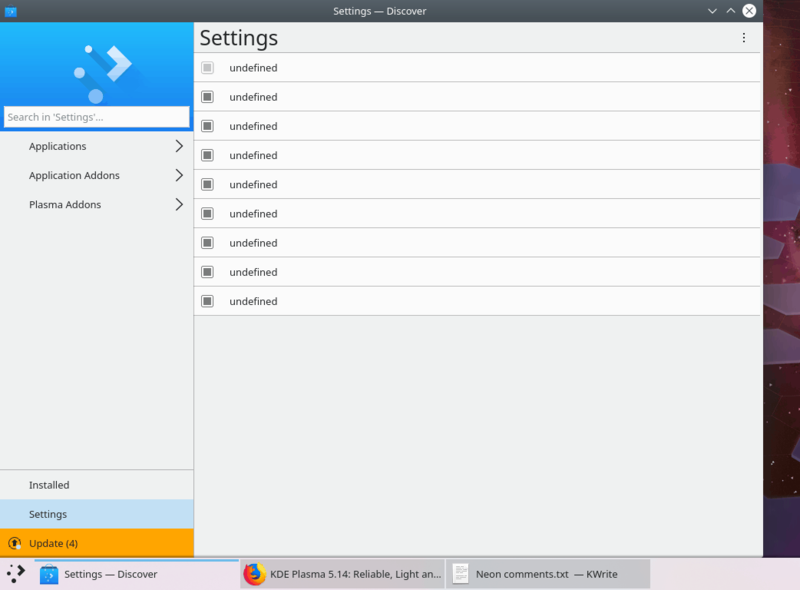 The new Deepin 15.8 comes with a lot of improvements and Deepin Screenshot was one of them. It now opens almost immediately. It does indeed work much like an improved version of Flameshot. Does anyone know a widget to switch the audio between that of the pc and the hdmi? Discover crashing (it was’t like that in 5.13) and lack of control buttons on media are known bugs of this release and are fixed in upcoming 5.14.1, just FYI. I’m using Plasma 5.14 on my Tumbleweed and I’m very satisfied with it, this DE is head and shoulders above all others. However if I have to recommend Plasma in production environment I would always recommend the Lts versions. 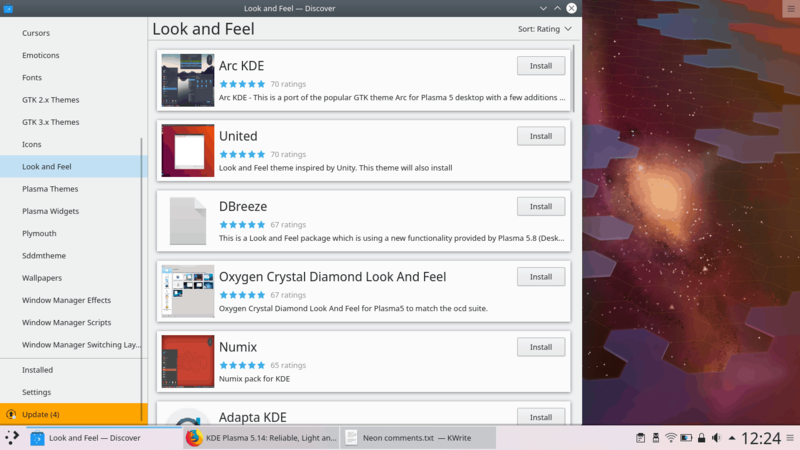 In the office use openSUSE Leap 15 with Plasma 5.12 and is a rock, closed bugs high reliability. On the home notebook I use as Tumbleweed with all the novelty, I always thought that the rolling releases should be avoided, but I had to change my mind. I installed Tumbleweed joking a year and a half ago and it’s still there, never had problems and Btrfs with its snapshots was a great find. A greeting. The Vault import feature is currently not exposed in the UI. Most of the users that requested it 1) were quite tech savvy 2) had use-cases which I don’t consider a good practice when security is concerned. That is the reason I decided not to have it exposed in the UI for the time being. If you really need this feature, I can give you a small hint on how to start the import wizard – there is a requestImportVault d-bus function. Feel free to contact me for any additional questions. I saw the mention in the release notes, so I expected to see it. I’ll wait for the official solution. Ok, KDE Neon based on Ubuntu 18.04 installed now but got bad surprise: fonts rendering on Firefox is terrible, pretty the same all over the distro even after installing Nvidia drivers and RGB settings. I am still unable to fix this issue. I have openSuSE Tumbleweed installed next to Windows on an extra laptop I acquired. I totally agree that Plasma is maturing very nicely. The speed of Plasma is amazing and rivals the lightweight environments. KDE development is on point and it shows. I am amazed at few bugs are encountered. There remains some annoyances, to be sure, and I fail to understand some of the default configuration choices. Plasma is the most advanced desktop environment around and maybe some of the odd configuration choices are ignored because the user can change just about everything to suit. One thing Plasma has in spades, is bell and whistles. How they have made Plasma so fast and responsive with so much available eye candy is incredible. Whenever I do boot into Windows the difference in speed is more than noticeable and it is Windows 7, not 10. Your take on Discover was spot on, too. The improvements have made it usable. Actually, it is coming along nicely. KDE will get it all together and when they do, Discover will be great. I also use Deepin 15.x and have become a big fan of the tagging function in the Deepin File Manager. Having a tagging function in Dolphin would be welcome. Once I started using it in Deepin it became clear that it’s the way to go for file management. I know there is tagging software and they do the job but once you use Deepin’s implementation, the other options are a hassle. Spectacle would be best screenshot tool around if the issues you pointed out were dealt with. Shotwell is great and so is Deepin screenshot but neither open as quickly as Spectacle. To solve that, I leave Shotwell minimized when I am taking a lot of screenshots. Why Spectacle has the include mouse pointer option enabled by default is another odd and annoying configuration choice. 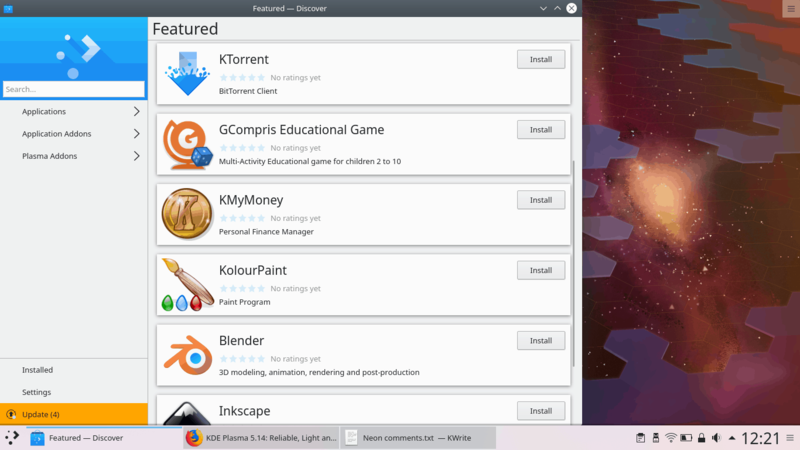 Overall KDE Plasma is awesome and so are many of the available KDE applications. I also like how the developers focus on getting things right with Plasma, instead cramming a boatload of new features into every update. 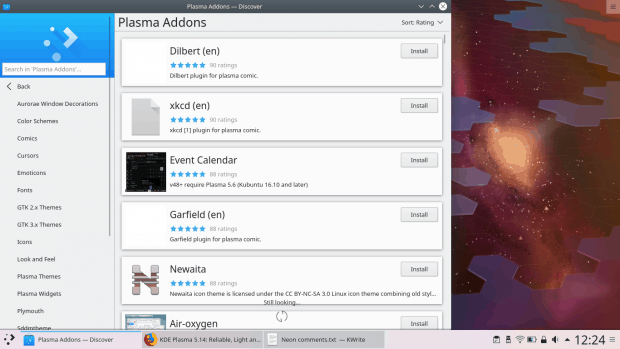 Plasma has room for some more features but it also has more of them already available out of the gate. Seeing these features constantly improving makes Plasma a great choice in desktop environments.